ANVILL is optimized for both desktop and mobile use. The Yamada Language Center has produced a web-based application, ANVILL-LTI, that provides media-rich tools for language instruction, and made it available for free to qualified language educators working in not-for-profit educational institutions around the world. 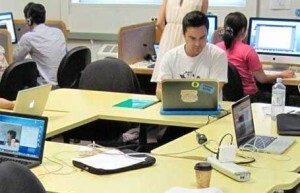 A 2011 E-Teacher program participant. 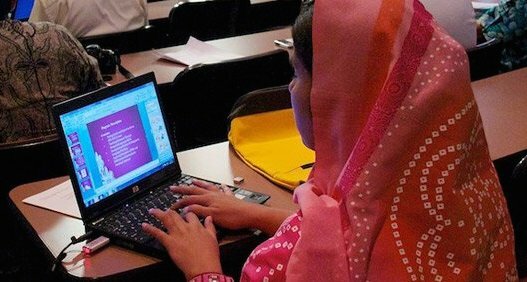 The E-Teacher Scholarship Program (funded by the US Department of State and administered by the American English Institute at UO) has in the past year served more than 100,000 English language educators in more than 180 countries worldwide (more than 90% were in locations outside the USA). These are a combination of MOOCs and instructor-led online/blended professional development courses with small cohorts of up to 25 participants each. 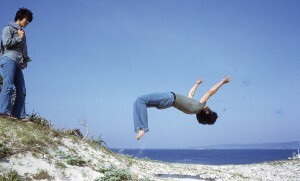 A “flipped” classroom moves content delivery online, in order to allow for more hands-on work when the class meets in person. Educational technology staff within the School of Architecture and Allied Arts developed a “flipped” course development program, bringing together faculty from different academic departments to build an intentional pedagogical community. Faculty were trained in a variety of techniques through which a face-to-face course might be enhanced via online curriculum delivery, provided ongoing support as they implemented these techniques in their own teaching, and then invited to present to the faculty and staff of the entire school, thereby continuing the cycle of innovation. Robust online learning begins with comprehensive faculty development. A department-based effort to create tools to encourage faculty members to update and innovate their course delivery, assisting them through the process of developing new courses and transitioning existing courses into hybrid and online delivery models. For detailed information, see Transitioning Courses from Face-to-Face to Online and Hybrid Delivery Models [PDF]. 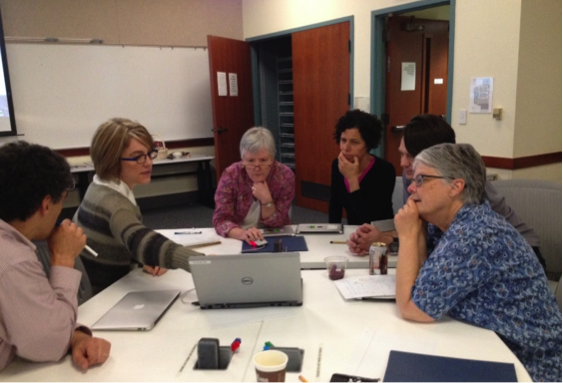 The first Active Learning working group met in 2014. The The Working Group on Active Teaching and Learning is an annual partnership between the Teaching Effectiveness Program (TEP), the Center for Media and Educational Technologies (CMET), and the Yamada Language Center (YLC) that assists a small faculty cohort as they seek to introduce active learning concepts into their courses.